We have been in business since 1997, and we pride ourselves in providing our customers with the best-quality henna art and products. We can be found at various fairs and festivals throughout south-central Alaska. Check our "upcoming shows" section to see where we will be next. You can book us for parties or events as well, go to "contact us" in the navigation bar to the left. You can order henna kits in the "buy our products" section, also found through the navigation bar. Mehndi or Henna is a natural dye which has been used for thousands of years by people all around the world. The term "Mehndi" is the Indian word for Henna, and it is also the term used to describe the art of applying henna. Henna is used mainly for decoration, from temporary body art to dying hair and fingernails. It has a cooling effect on the body and has even been said to have some therapeutic value for hair and skin. Is Henna/Mehndi safe to use? Henna is 100% natural, and is made from a woody shrub which bears the same name. The leaves are harvested and dried, then ground into a fine powder. It is harmless and causes no irritation to skin. 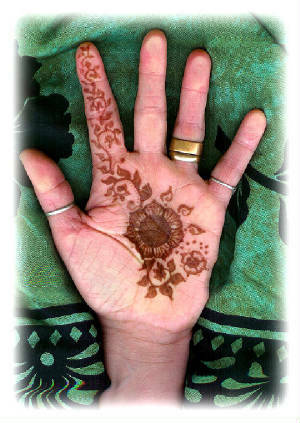 Henna is safe to use for all ages... women, men, children, and even the expecting mother can enjoy it's benefits. How long will it last? Henna temporarily stains the epidermis (the outer layer of your skin, which sheds) and only lasts for 1-4 weeks. The less you rub the area the longer the life of the stain. The depth of the color depends on the the length of time you leave it on your skin. The longer you leave it, the richer and deeper the color ultimately becomes. Henna lets you enjoy long-lasting, beautiful body art without the lifetime commitment of a permanent tattoo.. By using Henna as a safe and fun alternative, you can have a "tattoo" anytime you like, changing your design at will. Henna also stains best on the hands and feet; places that are often painful or difficult to tattoo succussfully. True pure henna cures to various shades of brown, but it's color will appear different on each individual, always flattering their skin tone. Why should I try it? This is a simple answer... it's fun, painless, and beautiful! Contact me for an appointment today! If you're having problems viewing our website, please notify our webmaster Shannon Plonta. Thank you!